VALBIOTIS (FR0013254851 – ALVAL / PEA/SME eligible), a French Research & Development company committed to scientific innovation for preventing and combating metabolic diseases, today announced an expansion of application for VALEDIA to NASH2 prevention. This new field of application is based on new results that demonstrate the clinical potential for the reversion of non-alcoholic fatty liver (NAFL), for NASH prevention. 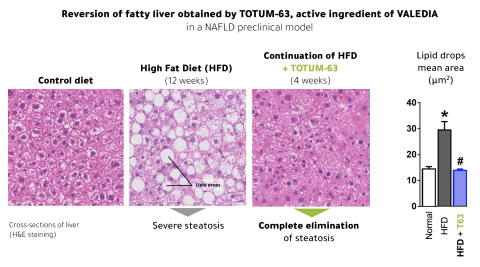 Studies conducted by the Leiden University (Netherlands), one of VALBIOTIS’ scientific partners, have demonstrated a complete reversion of fatty liver by the active ingredient of VALEDIA, TOTUM-63, in NAFLD3 in vivo model, confirmed by histological data. In parallel, in vivo studies have highlighted a mechanism of action of TOTUM-63 on three key cellular targets of the physiopathology of NAFLDs: the transcription factors Ppar ß/∂ and FXR as well as the Fsp27 protein. These data suggesting a mechanism of action focused on NAFLDs prevention will be presented at the American Association for the Study of Liver Diseases (AASLD) Conference, being held from November 9-13, 2018 in San Francisco, California. Based on these results,the Company plans to launch Phase II clinical studies in addition to ongoing studies for the risk reduction of type 2 diabetes. This expanded field of application strengthens VALEDIA as a precursor product for new prevention strategies in the field of severe metabolic diseases, focused on managing the risk factors for this diseases. 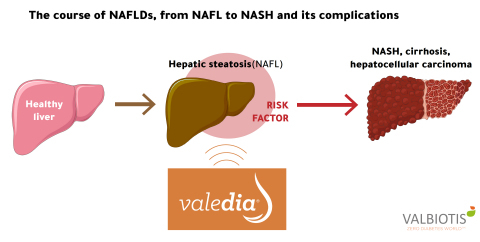 In addition to prediabetes, VALEDIA could be the first product for subjects with NAFL, the first stage of liver metabolic diseases prior to severe stages such as NASH. It is now estimated that these metabolic disorders affect 25% of the world's population and are expanding rapidly4. Prof. Samy HADJADJ, diabetologist and endocrinologist at Nantes University Hospital, commented: "At the current time, NAFL and NASH are highly prevalent in patients with an existing metabolic disease or disorder, related to insulin-resistance. Consequently, there is a genuine need for preventive strategies at the NAFL stage, to efficiently reduce liver fat, as the prognosis is poor for patients who develop NASH and no treatment is yet established except liver transplant for advanced stages. Regarding fat liver reduction, the results on VALEDIA are very promiseful, by correcting hepatic steatosis despite the continuation of a high fat diet. If these experimental results are confirmed in clinical studies, VALEDIA could constitute a valuable option for patients at risk of developing NASH." 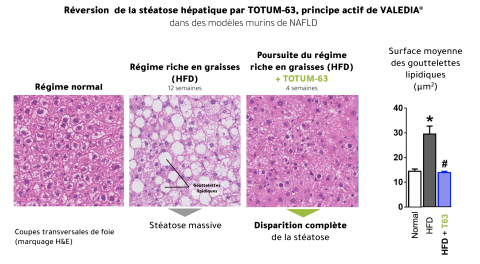 Bruno GUIGAS, researcher and assistant professor at the University of Leiden (Netherlands) conducted this study and details these results: "We conducted analyzes on histological, biochemical and physiological parameters of fatty liver: all converge towards a very significant demonstration of TOTUM-63 efficacy for the reversion of steatosis. " Mechanism of action studies revealed a significant increase in gene expression of Ppar ß/∂ (increased by a factor 3) and FXR (+30%), both key transcription factors of the hepatic energy metabolism. Simultaneously, the active ingredient of VALEDIA almost completely inhibited the expression of the protein Fsp27, which regulates lipid storage and is specifically expressed in steatotic livers. This mechanism of action, which targets control of the hepatic metabolism, represents a major asset in reducing the risk of NASH in the early stages of the disease. Fatty liver corresponds to hepatic steatosis, an accumulation of fat in hepatic cells. In NASH, steatosis is complicated by inflammation and tissue damage. With a poor prognosis, - 38% survival at 10 years, NASH can progress to fibrosis and cirrhosis, causing liver failure and, in some cases, liver cancer10.